Acts to prevent the development of tumours and promote their regression. This new genetic cell detoxifier could extend lifespan by activating the P16 tumour-suppressing gene Researchers are constantly and actively engaged in the quest to hold off the ravages of aging and extend human lifespan. The latest advances in genetics are generating significant new optimism1. Scientists have made a genetic breakthrough which they say could extend human lifespan and even protect against cancer. Experiments on mice have shown that their lifespan could be prolonged by up to 45%, without developing cancerous tumours. This suggests that under certain conditions, humans could live to almost 125 years, cancer-free, because the genes thought to be responsible are naturally present – and have identical roles - in both mice and humans. • The telomerase gene boosts the immune system and in particular, lengthens the shortest telomeres - the tips of chromosomes. It responds exceptionally well to astragaloside IV and cycloastragenol. • The P53 gene (or ‘tumour suppressor’) is activated more specifically by resveratrol and its derivatives. • The P16 gene, also a ‘tumour suppressor gene’, completes the picture by controlling anarchic cell mitosis. Recently, it has been possible to use P16 gene concentration, which increases in human tissue with age, in blood tests as a biomarker for cell aging. Manuel Serrano, a Spanish researcher at the CNIO, told a conference: “When P53 and P16 genes were activated in mice, cancer incidence was reduced to practically zero”. The Spanish scientists concluded that the activation of three genes – telomerase, P53 and the tumour-suppressor P16 – represented a major contribution to the prevention and regression of tumours by apoptosis (programmed cell death). They added: “We do not think that the mice lived longer because they didn’t have cancer, but because these genes protected them against aging”. This is therefore the first time that scientists have been able to prolong lifespan in mice in this way (by inserting an extra copy of the three genes), while protecting them from cancer. Until now, the mice were ageing without cancer, but their lifespan did not increase significantly. And only calorie restriction enabled their life expectancy to be extended. These transgenic mice, able to self-reproduce, have strengthened their new DNA model, thus creating a group of “supermice”, with longer lifespans of 4.5 years compared with the average 3 year lifespan, and that benefit from optimal protection against cancer. Bupleurum falcatum or buplevre, belongs to the Apiacaeae plant family and is used in traditional Chinese and Japanese medicine. It is widely considered to be a cell detoxifier that helps fight chronic infection and inflammatory conditions (particularly hepatitis). Bupleurum has recently increased in popularity due to favourable results achieved in cancer treatment. Its active principles are the saikosaponins A, B, C and D. Of these, it is the A form, a triterpenoid glycoside, that activates the tumour-suppressing P16 gene, but it is extremely rare and expensive - you would need to consume 50g of Bupleurum to obtain 4mg saikosaponin A. This new plant substance - saikosaponin A – has been specifically selected and isolated in order to activate the P16 tumour suppressor gene2. A number of studies have demonstrated the immunosuppressive effects of saikosaponin A. It significantly inhibits the proliferation and activation of T cells and induces apoptosis of cancer cells via mitochondria, making it a potential treatment for inflammatory and auto-immune disease3, 4. One study combined saikosaponin A with astragaloside IV. It showed that treated mice lived significantly longer than controls, however advanced their tumours. The Chinese researchers also observed that mice with cancer whose diet had been supplemented with saikosaponin A lived longer than healthy mice. This encouraging animal research has already led to the development of human application treatments in the oncology departments of a number of Chinese hospitals. The benefits of saikosoaponin A are enhanced when it is combined, though not simultaneously, with other anti-ageing substances. 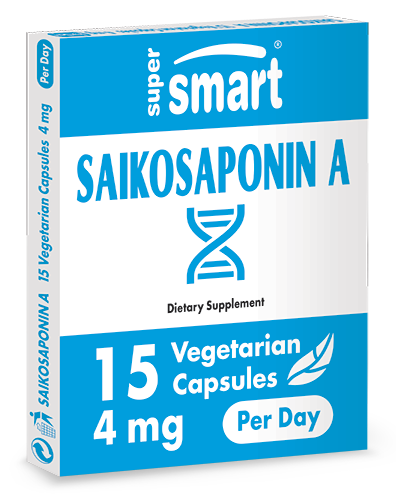 Supplementation with saikosaponin A is recommended on a non-continuous or alternating basis, ie, every other week, with astragaloside IV or cycloastragenol, which activate the telomerase gene, and with resveratrol and its derivatives, which activate the P53 gene. - Either a 4mg dose of saikosaponin A in the evening, and astragaloside IV and/or cycloastragenol in the morning. - Or you can alternate these products every other day. No adverse reaction has been observed to date. Caution: as saikosaponin A is a vasodilator, comparable to niacin, it should not be taken by anyone using coronary vasodilators, or by pregnant women or nursing mothers. 1 - Maria A. Blasco, Bruno M., Bernardes de Jesus : CNIO scientists successfully test the first gene therapy against ageing‐associated decline. Fundación Centro Nacional de Investigaciones oncológicas Carlos III. 2 - Wu W. S., Hsu H. Y. : Involvement of p-15(INK4b) and p-16(INK4a) gene expression in saikosaponin A and TPA-induced growth inhibition of HepG2 cells. Biochemical and biophysical research communications. Biochem Biophys. Res. Commun. 2001 Jul. ; 13;285(2):183-7. 4 - Yano H., Mizoguchi A., Fukuda K., Haramaki M., Ogasawara S., Momosaki S., Kojiro M. The herbal medicine sho-saiko-to inhibits proliferation of cancer cell lines by inducing apoptosis and arrest at the G0/G1 phase. Cancer research. Cancer Res.1994 Jan. 15;54(2): 448-54. Adults. Take 3 vegetarian capsules a week, on alternate weeks. Caution: saikosaponin A is a vasodilator: it should be avoided by women who are pregnant or breastfeeding, and those using coronary vasodilators. *It is still too soon to establish a strict administration protocol for this new product. Some people take saikosaponin A in the evening, and astragaloside IV and/or cycloastragenol in the morning. Others alternate these products every other day. No adverse reaction has been observed to date.